Home » Recipes » Charred Eggplpant And Peas, A Perfect Barbecue Side Dish. Back where I come from when stuff gets charred and there's not a barbecue involved, it's not a good thing. Charring usually involved opening a lot of windows, smoke alarms, yelling and calling the local take out.."Don't Cook Tonight, Call Chicken Delight!" The idea of deliberately charring something may seem scary, but believe me it's a basic of many sorts of cuisines. Deliberately charring under controlled conditions is a technique. In the Indian kitchen this is called charchari, and combined with boiling and sauteing it is the finishing touch that will give your vegetables a tasty, open-fire-cooked punch. Vegetables are added to a pan with butter or ghee, crushed spices, and some liquid, boiled for a bit, then fried and finally charred carefully! A lot of different vegetables can be prepared like this, but I happened to picked up some great baby eggplants from Lunita Farm at Saturdays' Farmers Market at the Sonoma Community Center . I decided to make charred eggplant and peas. Here's what to do. Chop about 1 lb of eggplant into 1 inch pieces. Dot the eggplant with 4 Tbs of unsalted butter cut into little pieces. and sprinkle the whole thing over the chopped eggplant. Boil it for about 3 to 4 minutes then partially cover the pan and lower the heat a bit. Cook it for about 30 minutes. the eggplant should cook down. When the water is nearly all gone toss in 1 cup of frozen peas. Note: if you're using fresh peas put them in at the beginning along with the eggplant. Keep cooking the eggplant, shake the pan occasionally so things don't stick, and cook it down until the eggplant starts to form a crust on the bottom and begins to char. Take the pan off the heat and let it rest for about 4 minutes or so, then stir it around gently mixing the charred bottom crust in with the rest of the vegetables. This is a great and "meaty" dish for Meatless Mondays. Add some rice, chapatti, whatever, and you're in business. 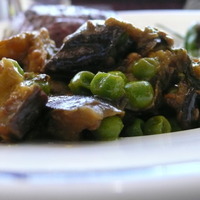 The mildly charred taste gives a nice, smokey flavor to the eggplant balanced by the peas. Other vegetables can be done in this fashion, it's not just for eggplant. I'm going to be trying this technique with potatoes and green beans and anything else I can find at the Farmers' Market. It gives a great cook-out flavor to a simple pan-sauteed dish and all it takes is about 30 minutes. The thing I love about this dish is that when people ask "is something burning?" you can say "damn straight it is!" I love eggplant and make many Italian dishes with it. I love Indian spices and am going to try this recipe.